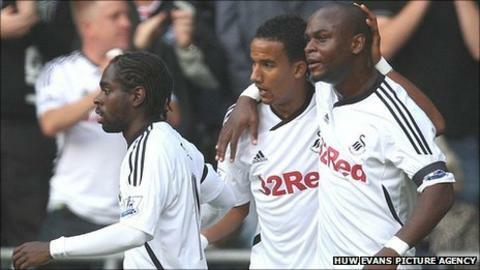 Scott Sinclair feels Swansea City's 3-0 win over West Bromwich Albion on Saturday has silenced their doubters. The Premier League newcomers had been pilloried in some quarters after four league games without a goal or a win. But Sinclair's 14th-minute penalty, after Paul Scharner had brought down Joe Allen, ended the goal drought and set Swansea on their way to victory. "I think people were writing us off saying we were going to struggle to score goals," winger Sinclair said. "But it's great to get the three points and the three goals. "It's come now and I don't think we had doubts, we had the confidence in the team where we can go out there and score goals. "The Gaffer [Swansea manager Brendan Rodgers] sets us out to make sure that any team that comes here, we make it hard for them to get about us." Sinclair scored two penalties in a memorable hat-trick last May when Swansea beat Reading 4-2 in the play-off final to claim a Premier League place. The 22-year-old showed the same composure at the Liberty Stadium on Saturday to beat Baggies goalkeeper Ben Foster from 12 yards to score Swansea's first Premier League goal. "I'm always doing it after training [taking penalties] and practising to make sure I put them away, so when I step up on the pitch I can do that," Sinclair said. "I'm delighted. It was a great team performance, we controlled the game well and we're happy we got the three points. "The midfield were great, they kept winning the ball and giving it early to me and Nathan [Dyer] so we could run at the defence." After the impressive win to get off the mark, Swansea next face a tricky trip to big guns Chelsea on Saturday. But Sinclair says he is eager to return to Stamford Bridge, where he began his professional career before joining the Swans in August 2010. "That's one team I'm looking forward to going back and seeing some old friends. It's going to be a great game," he added.